June 30, 2017, 10:02 AM · This week, adult beginner Michael Kennedy wrote about an experience that is altogether too common these days: he bought a violin on the Internet that turned out to be a VSO - a shiny Violin-Shaped Object that did not really serve. Happily, he found a better-quality instrument for himself at a violin shop. 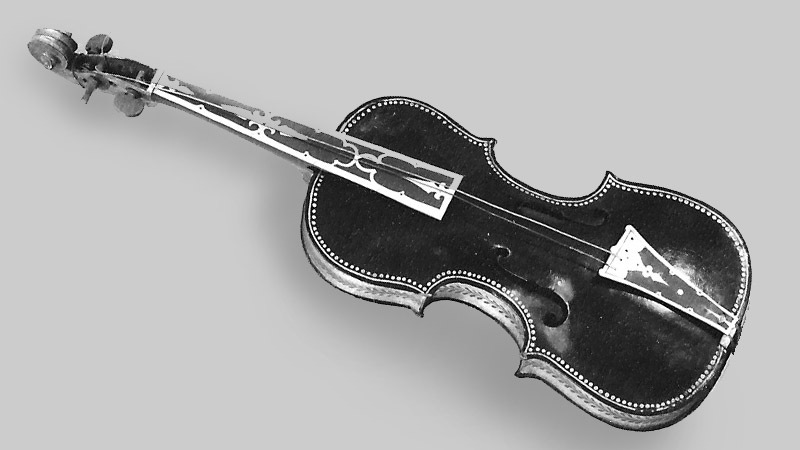 There are plenty of other such knock-off products: bow-shaped objects; shoulder rest-shaped objects; chinrest-shaped objects; violin case-shaped objects; bottom-of-the-barrel strings and rosin that simply should not be sold. It's actually pretty difficult to get through this business of learning and playing the violin without having at least a few experiences like this. What I'm talking about is a piece of equipment that you have to replace, not because it became worn out in a reasonable period of time or because you grew as a musician, but because it was so unbearably bad and ill-functioning that you decided you could not use it. For example, in recent years I bought a case that seemed like it was going to be just great, until I realized that my bow did not fit into it! A case that isn't the proper size for a standard bow, what?? As a teacher, new students have brought me some amazing examples of disfunctional equipment, the most memorable being a VSO that was painted pink (it came that way). Even the parent was a little sheepish there, "We thought it was pretty, but will it work?" Ah, no, and not just because it's pink. I've also had some situations that I found a little more heartbreaking: the well-meaning grandparent buying a VSO online -- the $200 was not a small sum for them, and yet it was an absolutely unusable VSO. Then there are the Chinese knockoffs of everything; some will serve for at least a while, some will fall apart immediately. A cheap case can be a real problem, especially if it damages the violin. Recently I discovered that the lid to a student's case was chronically pressing the frog of the bow up against the wood of the violin -- a recipe for damage! It needed to be addressed immediately. Other students have had cases that fell apart far more quickly than is acceptable -- they end up with no handle, broken zippers, loose lining, bow spinners that don't work, etc. Has it ever happened to you, that your instrument, or something you procured for your instrument, let you down so much that you had to replace it before the reasonable life of the object? What was that item, and what is your story? For the vote, if you have more than one such incident, go with the one that caused you the most consternation! June 30, 2017 at 05:19 PM · My violin case had combination locks and randomly wouldn't open for me one day! It was scary. June 30, 2017 at 08:51 PM · If you paid $100 for a car and found out that it does not run, would you write a blog and complain? Or is it because so many of the "Chinese " stuff we paid almost nothing for worked as expected so often that we forget the old saying "you get what you paid for!" July 1, 2017 at 03:22 AM · The problem is that you do not always get what you paid for. There are some excellent Chinese made violins for $200 - $300. I know because I have bought a few. But there are also rubbish violins in the same price range. Therein lies the problem : the first time buyer does not know what they are getting nor do they know what to look for. My only advice would be to buy from a well known violin shop. But even that did not work for my first violin as I ended up with an overpriced piece of European rubbish. It took me about 6 months to realise how bad it was before I moved on. July 1, 2017 at 03:37 AM · I bought a violin case (Precieux Premium Line, 4/4 Violin Softlight Case, Black Darkgreen, RC 10230 B/DG) for over one hundred dollars. When I closed it after a show, it failed to be closed completely. I investigated the problem and found that one of the snap buttons on the case used a male instead of a female snap. So one flap failed. The obvious human error of the sewer gives the consumer an annoying experience. Later the shoulder trap dropped after less than a dozen of times used. It turned out that the trap was sewed to the case with low quality thread. I really feel bad because of such annoying experiences. When I lodged a complaint to the music shop, no reply from the manufacturer has ever turned up. July 2, 2017 at 12:07 AM · German violinist David Garrett had a colossal fail with a light-weight case that didn't protect his ueber valuable violin when he fell while carrying it. July 2, 2017 at 02:29 AM · At the very beginning of my violin journey, I bought a violin for less than $100 from some guy and it turned out to be pure junk. However, the bow spinners in its case have been useful in replacing worn-out bow spinners in my other cases. Plus, I've made use of the chin rest that came with it on another violin (I don't remember clearly if this last statement was really true.) I have been loaned excellent violins that came in terrible cases that wouldn't protect the violin properly. Thankfully, I was loaned a nice case and I had good cases at home I could use to carry them. For fourteen months, I used a crappy metal viola C string on a restrung violin that pitch bended when I bowed hard at it. Plus, there were other playability and tonal problems with it. I knew the string wasn't properly scaled and believed that the length of the string was the problem. I put up with it, but those problems really hindered my ability to express because I was scared to bow hard. Plus, I had no idea how to approach solving the problem because a properly scaled C string was hard to find. Then I discovered that the length of the string was not the cause of the pitch bending because I installed a nice synthetic viola C that's also too long for the instrument that didn't pitch bend and pose problems at all. July 2, 2017 at 10:07 AM · I purchased an antique violin through an online auction. It is very beautifully made--at least on the outside! Beautiful inlaid purfling, and marquetry on the back. But it needed repair. When the local luthier removed the top, we found that the maker never finished the top. The bass bar was all one piece with the top, and the inside of the top was in a very unfinished state. I had it completed, with a proper bass bar, and it is very nice! same. Finding a collector and showing the fine piece i had .After 5 minutes he returned very angry for me to waste his time with a violin made from parts of old violins. July 4, 2017 at 05:53 AM · My first violin "kit" was Chinese, cost $300, and was a very good violin for the price. But the bow was very cheap and one day while tightening it, the plastic at the tip that held the hair plug in place broke.